If your house is anything like mine, laundry stains are a daily fact of life. For many of us, laundry tops the list of household jobs we’d rather not do. In fact, its often voted the one job we’d gladly hire someone to help with if we could. 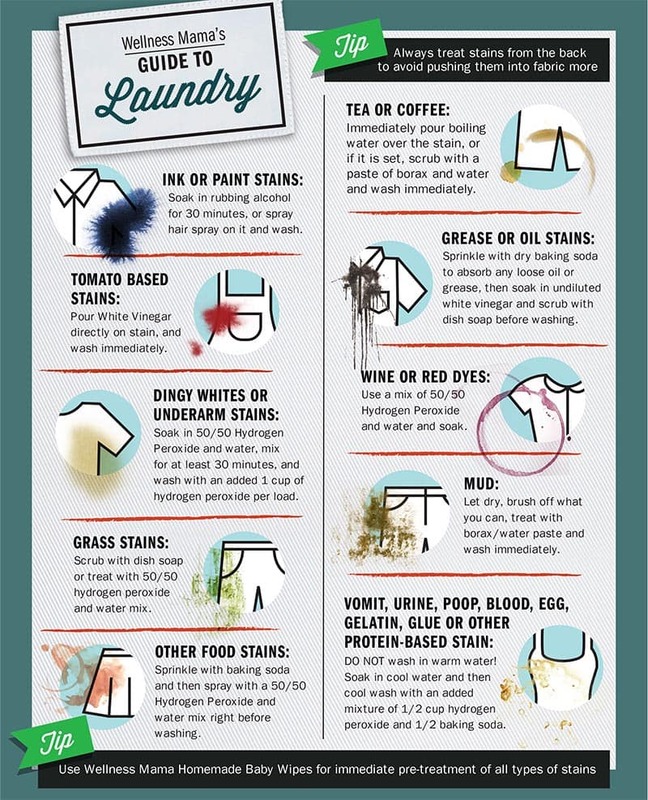 Especially with small children, stains make laundry even tougher. Even my most crunchy of friends will turn to conventional stain sticks and sprays to save clothes from being ruined. 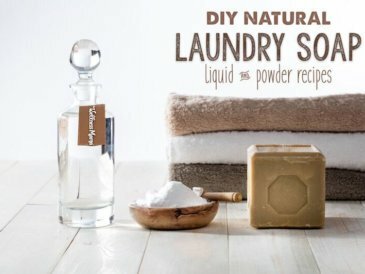 Yes, even friends who make their own deodorant, toothpaste, and laundry soap still use conventional stain removal methods. And who could blame them, since many natural stain removal methods just don’t seem to work on tough stains. Conventional laundry stain treatment solutions are some of the most toxic cleaning products available. 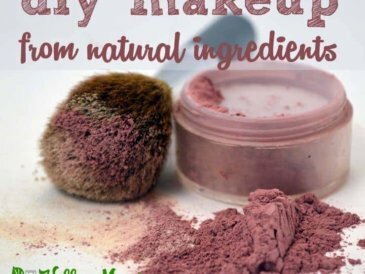 They contain harsh detergents, solvents, chemicals like sulfates and parabens as well as a host of artificial colors and scents. 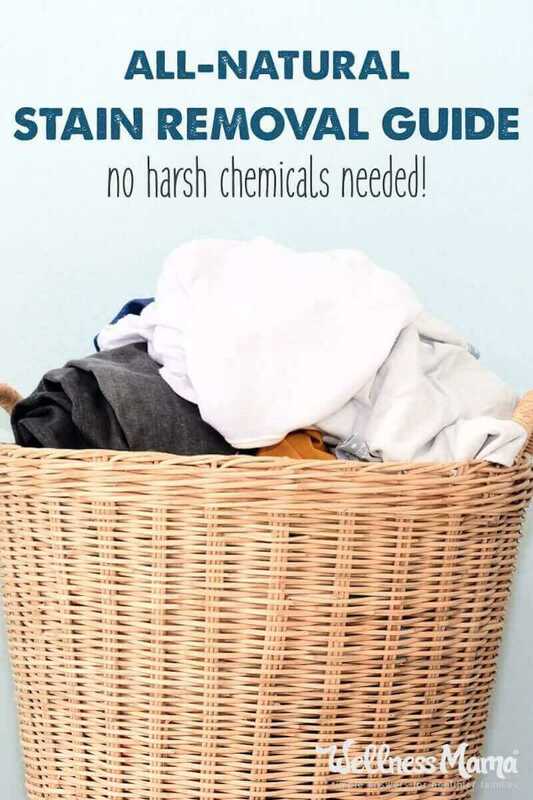 Borrowing some wisdom from my grandma’s era and the help of my professional stain creation experts (aka: my children), I compiled a helpful list of effective stain treatments for various types of stains. I keep this list handy for reference when I’m doing laundry. I’ve included a printable version (at the bottom of this post) in case it will be helpful to you too. Removing stains naturally takes a little more know-how and work than using a one-size fits all spray. 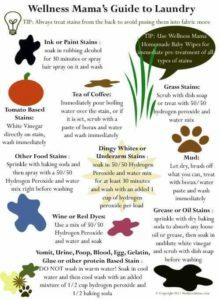 When used correctly, these methods are highly effective (and you won’t have to keep the poison control number on hand!). TIP: Always treat stains from the back, rather than the front, to avoid rubbing the stain in more. Tomato-Based Stains: Treat with white vinegar directly on the stain and wash immediately. Vomit, Urine, Poop, Blood, Egg, Gelatin, Glue, or Other Protein-Based Stains: DO NOT WASH IN WARM WATER!!!!! This will set in the smell. Soak in cool water and then wash with an added mixture of 1/2 cup hydrogen peroxide and 1/2 cup baking soda in the washing machine. If you’re wishing for an easy way to remember all of these treatments, see the convenient printable guide below! When I encounter stains that don’t respond to the methods above, I’ll use stronger products that still contain natural ingredients. My favorite is Dr. Bronner’s Sal Suds, which gets an “A” from the Environmental Working Group, and which is an amazing all-purpose natural cleaner. The closest non-toxic alternative I’ve found to stain removal sprays is this homemade version. 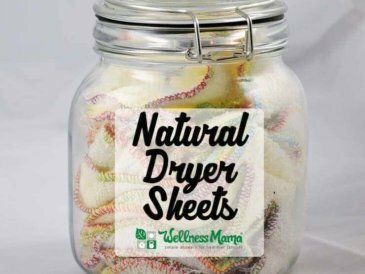 It takes under two minutes to make, and can be kept by the washing machine for easy use. Put the water into the spray bottle. Place lid on bottle and swirl gently to combine. Spray on stains before laundering to help remove even tough stains. My homemade baby wipes can be kept in a small Ziplock bag and make a great pre-treat spot remover on the go. 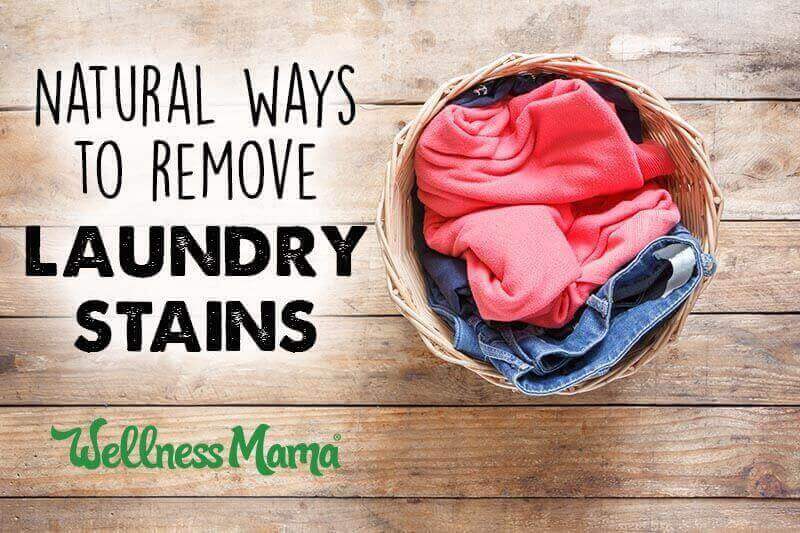 Add 1 tablespoon Sal Suds to a load of laundry as a natural stain-removing booster. 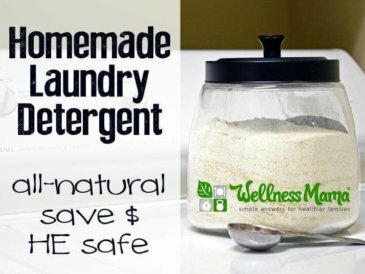 Making your own laundry soap is a great way to save money and avoid artificial fragrances and harsh chemicals. 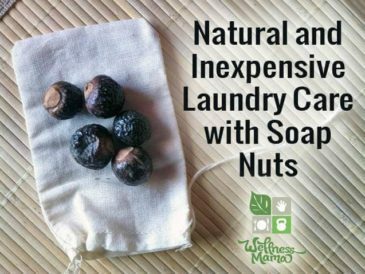 Try these homemade laundry soap recipes, or use this modified version if you have an HE washer. Here is a printable version of the infographic above: Click to download. 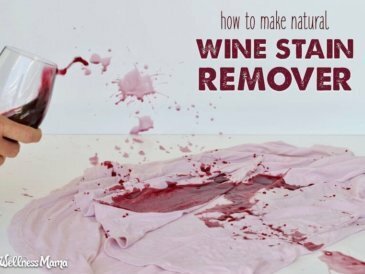 What’s your best natural stain treating trick? Please share below! My kids could put it to the test….